This Black Bone Collar Tag can be laser engraved personalized with your pets name and a phone number to ensure its safe return. Each tag comes with a key ring just as shown in the picture. Up to three lines of laser engraving come with this product. When ordering simply input a comment in the notes section detailing what you would like us to engrave on your tag! 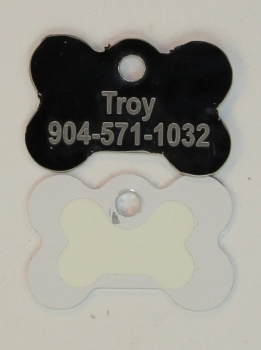 The back is glow in the dark to increase the visibility of your pet in low light conditions. Do you own Black Dog Bone Pet I.D. Collar Tag with Glow in the Dark Back ENGRAVEDPETIDTAG_BONE_BLACK_GLOW? Tell us about it! Have a question? Ask!